Alien OG is an unbelievably potent genetic mix, bred by crossing a female Tahoe OG and a male Alien Kush. 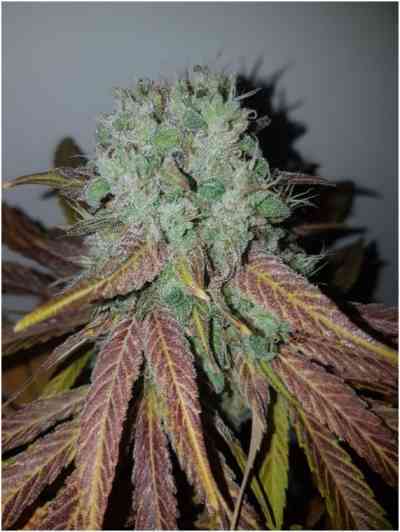 With its THC level of up to 28% it is one of the highest tested marijuana varieties of all times. All it takes is one toke and your mind will take off like a flying saucer! This galactic weed is recommended to the seasoned and die-hard pothead. The buds will be ready for reaping after 9 weeks of flowering and emanate an overwhelming lemon and pine smell - you will have to bag this weed twice or more if you take some buds with you! The laid back but happy and uplifted vibes that come from this weed make it one to cherish. The effect of this strain is great for battling severe headaches, pain and stress. It has also been reported to provide relief to ADD/ADHD patients in regards to keeping their attention on task.